SHANDONG PROVINCE – Vancouver’s BQE Water has signed a pair of contracts to complete feasibility studies to install the equipment for its SART process and to modernize cyanide destruction for two of the top 10 gold producers in China. These studies are being undertaken in response to advancing environmental regulations and to enable the processing of feedstock with elevated levels of cyanide soluble copper. The feasibility studies will have BQE Water complete metallurgical and wastewater treatability test work in China and develop a sufficient level of engineering to confirm overall project economics, construction budget and schedule for possible implementation. Regulations around the world are advancing and target not only residual cyanide contained in wastewater and tailings produced by mining and metallurgical operations but also place strict limits for cyanidation and cyanide destruction by-products such as ammonia, cyanate, thiocyanate and nitrite. The goal is to ensure all discharges are non-toxic and do not cause impacts to the receiving environment. As such, proper cyanide management is key to the permitting of new projects and securing a social license for gold producers. Gold output for Shandong Province reached 120 tonnes (3.8 million oz.) in 2018, accounting for 30% of China’s total gold production. The province is home to the country’s top gold producers who are expanding their influence globally. 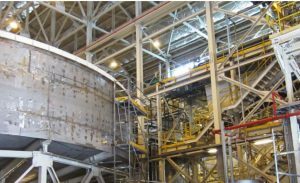 In the region alone where BQE Water’s new Guoda water treatment plant recently began operation, there are over a dozen metallurgical plants that focus on gold extraction and refining. A key aspect of cyanide management is cyanide recovery and recycle. The more cyanide that can be reused, the less fresh new cyanide that needs to be consumed and the less cyanide that must be destroyed by using additional chemicals which produce by-products requiring additional management. BQE Water is a global leader in the SART process which enables cyanide consumed by base metals to be recovered and recycled, lowering the cost of gold extraction and reducing the environmental footprint of gold mining projects. BQE Water also provides solutions to manage the by-products of cyanidation and cyanide destruction such as ammonia, nitrite and thiocyanate removal. Learn more about the SART process and cyanide management at www.BQEwater.com.